Three video games featuring characters with mental health conditions have been created to fight the social stigma. Scientists, game developers and mental health advocates came together in Cardiff to tackle “prejudiced” mental health portrayal in gaming, said researcher Simon Pardinas. Munzir Quraishy, who offered his own experience of OCD for one of the games, said it could help people empathise. Mind Cymru said more representation would help patients deal with stigma. How does gaming change your brain? The three games – Picturesque, The Interview and Get Help – took 48 hours to design at a Cardiff University gaming jam. Munzir Quraishy, who has obsessive-compulsive Disorder (OCD), depression and an eating disorder, offered his experiences for the game Picturesque. 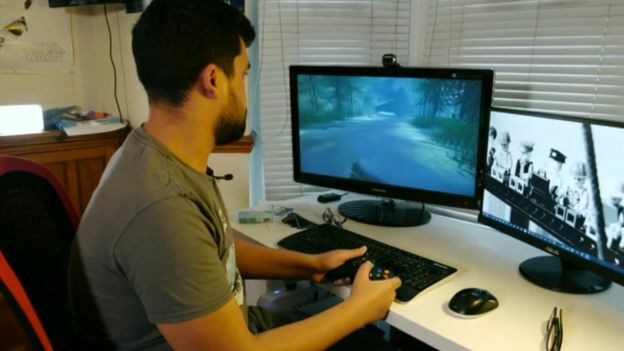 Mr Quraishy, who is studying medicine at Cardiff University, said the game shows OCD is not just about cleanliness, but is “the process of having an intrusive thought and trying to relieve it”. The character is tasked with photographing an extinct animal, but his OCD and intrusive thoughts make this difficult. The 24-year-old from London said games help him to “get into the shoes” of different mental health conditions. “Just because I have a mental health problem, doesn’t mean I understand all mental health problems,” he said. Volunteers from the National Centre for Mental Health (NCMH) set up the gaming jam last year, but the games were officially launched to the public in January. One of the organisers of the gaming jam, Paul Gauci, said the stigma attached to conditions like depression or OCD was “often seen in video games”. The team, known as Jammind, wanted to “frame mental health in a positive light while also being fun and educational,” Mr Gauci said. How does social media affect mental health? Will quitting Instagram make me happy? Simon Jones, of Mind Cymru, said: “While attitudes are changing, there is still a great deal of stigma for people to overcome before they feel comfortable talking about their experiences. The jam was hosted by the MRC Centre Neuropsychiatric and Genomics at Cardiff University, NCMH and funded by the Wellcome Trust.